I speak as a Liberal when I say that nine score and a handful of years ago, our fathers brought forth a great idea into the political firmament. It was a logical extension of the anti-slavery movement, and it was called 'free trade'. It framed the debate about business in terms of human liberty, explaining that when businesses get too big, or when they join forces with governments or ally with landed interests, then the prices rise - and those people who have been released from slavery fall victim to a new economic tyranny. That was the 1830s. Thirty years later, simultaneously on both sides of the world - the North American slaves and the Russian serfs were declared free (both in 1863). In both cases, the worst fears of the new free-traders came to pass. The liberated slaves of the deep south and the newly freed peasants of Russia and Poland were both loaded down with debt which they could never repay - a new form of economic control. Forty years after that, the American free traders took on the robber barons and monopolists in a series of actions, breaking up Rockefeller's Standard Oil and others. At the same time, the British Liberals were winning a landslide election on the cause of free trade - which they regarded as the right of small enterprise to challenge the status quo. Over the following century, something peculiar happened. 'Free trade' became muddled. The Liberal campaigners turned to other things. Free trade slowly came to mean the rights of all business, however large. Later on, it became even more twisted to mean the right of the richest and most powerful to ride roughshod over everyone else, almost the precise opposite of its original intention. Now, the news emerges that the long-term negotiations to bring about a EU-US trade agreement are back on. What is in it? Some sensible stuff about recognising each other's standards and regulations probably. The issue of GM food and cloned meat will take a bit of unpicking, and probably remains unpicked. Why worry about it? Because of what has appeared on Wikileaks about the draft of the new US-Pacific trade agreement, which was to have been 'fast-tracked' through Congress, and which includes a supra-national court system whereby any corporation can sue a government if it felt it was infringing its rights. There is no way that a package of measures that pits the commercial objectives of the richest above our democratic rights to shape our lives is related to free trade in any sense. It is a kind of protectionism for the powerful, and for the status quo. It is the precise opposite of anything Cobden and Bright would have recognised. For years, we in the political West have comforted ourselves that free trade in China would transform it into a genuine tolerant democracy. I'm not so sure that this perversion of free trade, monopolistic control bolstered by law - a kind of compulsory trade - will not eventually work the other way, and turn us into China. But there is a more prosaic reason to worry about this. The EU has a reputation in some circles for its mind-numbing regulation. Most of these are, in fact, as a direct result of the single market that the UK pushed through in the 1990s. Ironic, isn't it. Regulations about transparent procurement processes, and permission for state aid payments, all stem from the same source. Probably the US trade agreement, if it happens, will mean more of it. That is free trade, of a kind. But in practice, it privileges large foreign competition against homegrown small business competition. It needn't do, but in practice it does - because only the biggest players can jump through the bureaucratic hoops (and that's before you get to the minimum size thresholds). Like so much of the rest of the ersatz free trade agenda, it gives power to the powerful and protects them against competition from below. It is the very opposite of a Liberal free trade policy as recognised by Cobden and Bright all those decades ago. So wrote the poet Sheelagh Pugh, and I kind of agreed with her yesterday when I read about the Bank of England's decision to rein in Funding for Lending, and to provide a kind of ratchet effect that will reduce the dangerous acceleration of the housing market. It isn't much and it isn't enough, but it is a start. But first a bit of background. One of the stories I told earlier this year in my book Broke: Who Killed the Middle Classes? was about the demise of the so-called Corset in 1980. The Corset was the mechanism which restricted the flow of money into the mortgage market, so that house prices stayed stable, but housebuilders still made a profit. Since it disappeared, the 30-year house price bubble - especially in the south east - first thrilled the middle classes and now looks set to destroy them (my children will be unable to rent or buy in London or the south east unless they work in financial services, a fate worse than death as far as I'm concerned). The issue isn't really that the Corset should have stayed in place. The end of exchange controls in 1979 guaranteed its demise. The problem was that nothing was put in to replace it. In fact, within months of the decision to end the Corset, the whole tenor of the debate had shifted. We know now that the idea that somehow all prices reflected something real was a fundamental mistake which still infects many – especially in banks, where they still bolster their balance sheets with property values, only to have those values slip through their fingers. We might know that now but, by the end of the Corset, it flew in the face of the new spirit of the times to point it out. Hidden in the archives of the Bank of England, I discovered a revealing note. It was a memo from the governor (Gordon Richardson) in May 1980, weeks before the Corset was finally loosened, and described meeting a City grandee who asked him why nothing had been put in place to replace it. "Were he a Tory MP he would I fear rightly qualify for a certain adjective in rather wide current use." The adjective he referred to was ‘wet’, Margaret Thatcher’s new designation for her opponents in the cabinet. ‘Rather sad, I think,’ wrote the governor. Nothing has replaced the Corset, and Thatcherism – heralded by the new and vigorously enforced consensus implied by this note – would countenance no such defences against insanity. House prices would find their proper level, whatever they happened to be, and the acceleration upwards had barely begun. The consequences have been profound. Carney hasn't proposed a return to the Corset, but he has tiptoed in that direction. Banks will have to assess whether people taking out mortgages will be able to afford an increase in base rates to 3%. They will have to raise extra capital against the mortgages they lend. There is no doubt that this will contract mortgage lending, though whether it will really increase small business lending remains to be seen - the evidence so far is that the big banks are no longer geared up or able to do this effectively. I've just got two thoughts about this. First, property prices in London and the south east are unsustainable. They are geared for the pockets of the ultra-rich, for bankers bonuses and foreign investors. They need to come down, slowly but surely, to make civilised life possible for the next generation. Second, nobody seems to talk about this much, but the main source of money-creation in the economy these days is in the form of mortgage loans. If they contract, and nothing replaces them, there will be less money in the economy - and we will all be wondering why the world is deflating around us again. That is the consequences of our collective failure to rebalance the economy. I listened to the Localis lecture by Penrith MP Rory Stewart yesterday, talking about the importance of local action - if we are going to fulfil our promise to our children that they can grow up and re-make the world. He told the story of a small village in his constituency and their long battle to get a broadband connection, digging the trench, raising money and eventually persuading the government to fund the remaining £17,500 - a long, exhausting process. Exhausting because of the complications which inevitably emerge for this kind of project: was the decision to choose the only possible contractor open and transparent? Would Brussels give permission to pay this money in state aid? You can imagine the kind of thing. All this is, of course, paradoxically the result of the single market, the side-effects of a certain interpretation of free trade - and I expect there will be even more of it imposed on us under the new EU-US trade agreement. But it also demonstrates the sheer complexity of making anything happen now, however simple and uncontroversial. The sheer complexity of government at all levels discourages action: we don't know what side-effects there will be. It is often just too much of a risk to experiment by finding out. If the political world is too complicated then the same is even more true of economics. The economic world is so staggeringly complex that no sane economist will be able to predict the consequences of anything much. The result is that economists, like civil servants and politicians, are like deer caught in the headlights. They dare not even imagine major changes. They dare not, even in their sleep, dream of different worlds. Which brings me to the new book I have edited called What If Money Grew on Trees? 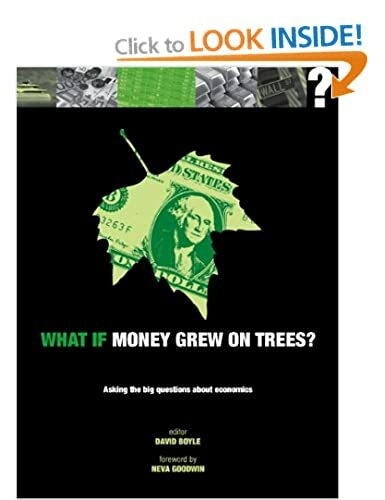 It is a series of very short contributions, by economics writers, in answer to 50 different What If questions - what if money did grow on trees? What would happen? These are alternative tales of the present and immediate future, written as honestly as possible about the effects and side-effects. And one of my co-authors (Andrew Simms) and I are delving into the world of other possibilities, at the winter version of the Hay Literary Festival at 1.55pm on Sunday. Do come along and imagine with us! I know this isn't the kind of thing that we bloggers are supposed to admit, but really I have been staggeringly naive about banking in practice. Let's set the Co-op Bank on one side quickly. I realised that the Co-op Group gave money to the utterly toothless Co-operative Party, and didn't think about it, but I never realised - and this is entirely my fault - that Co-op Bank funded the Labour Party directly. Everybody else seems to have known. There is no way that I will keep my accounts there if they carry on doing so, no matter how good their call centre is. I joined the Co-op Bank to make the world a better place. Giving money to the Labour Party actively frustrates that objective as far as I'm concerned. But there is more to confess. For years, I've been hearing rumours and accusations from small businesses that the big banks were deliberately forcing them into difficulties, so that they could drive them into the arms of the equivalent of their restructuring advisors. I've heard rumours that banks had been going through the fine print of loan agreements in order to force small businesses under. I never imagined that this might have been a deliberately organised instrument of banking policy, yet that is what the Tomlinson Report suggests, now in the hands of Vince Cable. The accusation here is that RBS deliberately drove viable small businesses into difficulties, so that they could earn considerable fees from the bank's Global Restructuring Group, and get their hands on their underlying securities and assets. Vince Cable says the allegations are 'shocking'. Robert Peston says it is "not altogether surprising". I find both of these responses strange. Of course they are shocking. But the truth is that these are by far the most serious allegations made against the big banks so far. They go beyond selling sub-prime mortgages or fixing Libor rates, and yet we appear to have become so used to allegations of very well paid wrong-doing that we barely notice it any more. If these revelations had been made against small banks, it seems to me that the police would have been called in by now - and quite rightly. We are talking about the theft of people's businesses and assets. We are talking about the deliberate destruction of viable businesses by the only people who can rebuild the real economy: local entrepreneurs. It is worse somehow than anonymous burglary. It is mugging by those who you trusted and who owed you a duty of care, because you paid them to look after your interests, more like family abuse than fraud. The Daily Mail led on the story yesterday morning, but generally speaking the story has received far less attention than it should, and very much less than the spectacle of the Rev. Mr. Paul Flowers and the drugs. So if I were Vince Cable, I would call in the police immediately. No other news has so emphasised the basic underlying mistake the opinion-formers and politicians have been making about the big banks. They consistently behave as if the sins of the big banks were sins of omission: they failed to lend when they should have done. The truth is much more worrying, and has been clear long before the recent revelations. They have been actively corroding our local economies and unbalancing the economy. Richard Morris at the the blog A View from Ham Common has done us all a service with an online poll among Lib Dems about which policies should be emphasised in the next party manifesto. Top of the list, perhaps unexpectedly, came housing. Followed by jobs & sustainability, bracketed together. Not sure which I would have chosen to go first, given the choice: probably jobs & sustainability, followed by 'children'. Two things occur to me about this which make it slightly uncomfortable.reading, and all because the the besetting Lib Dem sin about this kind of thing - the fantasy that somehow electoral success is all about polling and positioning. This is not a criticism of the poll, quite the reverse. But the first problem is this. It is one thing to say that housing should be top of the party's campaigning list, but quite another thing to develop real solutions that are up to the enormity of the task. Party president Tim Farron has important proposals to make about rural housing. There are Lib Dem councils which have done imaginative work backing community land trusts, to keep the value of the homes low. But where are the policies to ratchet down ballooning house prices? Where are the proposals that back up Nick Clegg's lead on garden cities? These might be forthcoming, but the party needs a distinctive role to play in the national debate about housing, and at the moment it doesn't. The second problem is that all these topics actually beg questions. They seem to imply specific policies, but may not actually do so. I'm assuming that the people who picked 'housing' meant the rapid building of social housing, by system or systems unknown, but actually we don't know. Previous polls - and I've seen so many of them - have tended to put 'environment' low. Bracketing sustainability with jobs forces it up the list, and we assume this implies some kind of systematic development of green jobs - but, actually, we don't know. I've always believed that the sensible move for the party would be to bracket the environment with health. In fact, health usually has its own category, and we assume this is ticked by people who want more health spending - but actually we don't know. Often, in fact, this kind of poll tends to reflect what's in the newspapers. 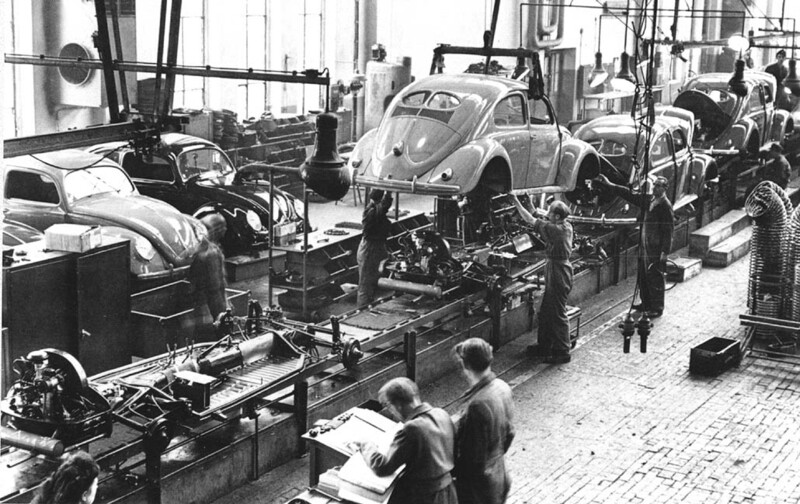 To be useful, it needs to test specific policy proposals. What Richard's poll gives us is a guide to where we should put our efforts to develop those specific policies - housing, jobs, environment and (because it needs to be linked to the environment) public health. The planning minister Nick Boles has suggested reviving the National Liberal Party, the strange hangover from the 1931 National Government that eventually petered out when the electoral alliance with the Conservatives petered out, in the 1950s. Let’s leave aside his motives, or whether they are in any way achievable, and just say that – rather to my surprise – the Lib Dem group in the House of Commons has been really staggeringly united during the difficulties of the coalition. This is a tribute partly to the Clegg leadership, despite the background noise, but also to five decades of electoral discipline – learning it the hard way. And, also unexpectedly perhaps, what must - whether we like it or not - be a degree of common understanding of the issues, a shared ideology, again despite the clear disagreements and the background noise. So I don’t think – though I may be wrong – that there will be any sign of a breakaway grouping of Conservative-leaning Lib Dems. Jonathan is quite right to link the distrust of ideology with the strange growth of platitudes around ‘evidence-based policy’. So let’s peer at this phenomenon a little more closely. Nobody is in favour of evidence-free policy, of course. The problem is that ‘evidence-based policy’ is not the opposite. As currently understood, it is a discrete branch of utilitarianism. Underlying evidence-based policy is the assumption that, before change can happen, the right kind of numerical evidence must appear. Often this kind of evidence is quite impossible, one way or the other – and evidence-based policy thus becomes an argument for inaction, dressed up as hard-headed objectivity. It isn't objective, of course. Numbers look hard-headed but they are actually chained to definitions, which are endlessly malleable. Numbers can take you by surprise, yes, but you can't rely on numbers alone. Evidence-based policy is at the same time a deep and abiding scepticism about change of any kind, except tiny changes, linked to a deep and abiding reliance on a particular kind of statistics – an implicit belief that, despite indications to the contrary, that the target figures (any figures actually) must be true and accurate. It isn’t really about evidence at all. It is Gradgrindism dressed up as open-mindedness. “He had an open mind for so long,” somebody said of Bertrand Russell, “that he couldn’t get the damn thing shut.” That’s evidence-based policy. It leads to inaction, as I said, but it also leads to a great deal of absolute tosh. Because the Prime Minister wants evidence-based policy, then he must be given graphs. The figures may be based on the tiniest samples – they may be wholly inaccurate – but it is evidence. Then there is the worst of it. Evidence-based policy, as currently understood, can only compute evidence from institutions as they currently exist. That is the only possible source of this kind of evidence. It rules out consideration that those institutions might be very different. Why? Because not only is there no evidence in the approved shape, but there can’t be – the world will have shifted and the definitions changed. I’ve talked to medical statisticians about how flimsy the evidence used by NICE is. I know from my own experience in government departments how graphs get created out of the flimsiest stuff. But it’s evidence-based policy – how can anyone possibly be against it? Jonathan is quite right that this tends to go hand in hand with a scepticism about ideology. Ideological approaches certainly need to be subjected to common sense, and real evidence – the stuff you get by looking at things and talking to people. I can think of so many ways in which ideology has undermined policy. But there is another way of looking at these things: bringing ideology to bear on problems is to look at them sideways, from the point of view of a philosophy and a tradition. Often that is the only way you can break free of intractable problems. You can’t do it regardless of evidence, of course. But don’t let’s allow ‘evidence-based policy’ to stop us, because it isn’t what it seems. It looks like a hard-headed guide for common sense. It actually conceals a delusory lens that will always support the status quo. First, a bit of transparency is required. I’m a customer of the Co-operative Bank, and I’ve been irritated with them for ages – long before they imploded – mainly because (silly, I know) of their habit of sending me bank statements with one or two transactions on. The reason I stay with them, despite the recent revelations, is because the Save Our Bank campaign has told me to wait and see – and I see the logic in that – and also because of their excellent, friendly and effective call centre, which is no small thing. I promised I would leave the Co-op if the hedge fund deal went through, so I will still leave if they renege on any ethical positions – or if they dump the call centre. The hedge funds need to be kept up to the mark. But I am also aware, as Lord Myners said yesterday, that the hedge funds are not completely committed either and could pull out if there was a mass walk-out by customers. It looks like Mutually Assured Destruction to me (if only Vince Cable had threatened to veto the name before negotiations with the hedge funds). What is fascinating about the revelations about their chairman, the Rev. Mr. Paul Flowers, is not how unusual it is but how much it brings the failures at the Co-op into line with the other big banks. The big banks also had key appointments without enough banking experience (HBOS). They also succumbed to disastrous mergers with rapidly disintegrating loan books (RBS). It just goes to show, as the Guardian said today, that the Co-op is not in trouble because it is a mutual, but because it is a bank. What underlies this very public witch-hunt against Mr Flowers is that he was a political appointee, and this is what terrifies the financial establishment about local banking. They are afraid of bankers appointed because of years of service to the Labour Party in some one-party fiefdom, lending public money out to approved vanity projects. They are afraid of the emergence of the Bank of Our Friends in the North. But again, the scandal is not about small banks, it is about the hopeless regulation of big banks. The truth is that most other countries, in Europe and North America, have local banks that underpin their local economies. They also have banks that are linked in some way to local government. We have new banks along these lines in Cambridgeshire and Salford, with more on the way, using local assets, pension funds and deposits to support productive business - just as the big banks seem to have lost their ability to do so. Their track record across Europe is not blameless, but those networks of local banks which rode out the recent banking storm without investing in dodgy bonds or turning to much attention to the global markets - sticking to their core skills – have provided a secure basis for those economies locally which we lack. Because the truth is that there is a kind of snobbery about the way we have done banking regulation. It allowed the big banks to do pretty much anything they could finesse, but traditionally strangled the small and local banks before they could launch. And all for fear of the Bank of Our Friends in the North, when all the time political appointees were staring them in the face. One new co-operative formed every working day of the week. Over six thousand co-operatives in all. Two thirds of farmers in Scotland are now part of agricultural co-operatives, creating a commercially very highly successful sector. In short, it is big banks that are in crisis, not the growing mutual sector that is able to achieve things that conventional business can't. My nine-year-old came back from school yesterday evening in a cynical mood. What had piqued his cynicism was the constant repetition, in rhetoric and on noticeboards, that his primary school is a 'Rights-Respecting School'. "They say they listen to us and ask our opinions," he said crossly. "They never do. They just shout." I have some sympathy with this, and the vacuous round of tickbox titles. I also have sympathy with the institutional gap between rhetoric and reality in public services, and their capacity for self-delusion, and the conversation made me think of yesterday's NHS announcement. The Department of Health has spoken and now we have a response to the Francis Report and all the others that followed the scandal of Mid-Staffs. The answer is a flurry of measures and controls. As so often, the influential NHS blogger Roy Lilley hit the nail on the head yesterday morning when he talked about the fear of the regulator, and frontline staff's fear of the managers, being greater than their fear of upsetting the patients. On the face of it, these measures - forcing wards to declare their nurse-patient ratio, the duty of candour - are all sensible in themselves, but I am still nervous about them as a whole. I don't want to take a high moral position on this - I don't have to run a ward or look after patients. I don't have to balance the books of the NHS, but three things worry me. The first is the Rights-Respecting-School conundrum. This kind of rhetoric never seems to quite do the job. Efforts via tick-boxes to make sure reality gets in line just seems to make the rhetoric even more vacuous, and the same I fear will happen to Jeremy Hunt's "safest healthcare system in the world". You can't measure your way to that kind of objective, and here is my second worry. On its own, forcing transparency on nursing levels seems a sensible move, but nurses seem scarce these days - because of the very battery of targets, standards, tickboxes and measures that this one adds to. Separately, they seem sensible. Together, they amount to the very hollowing out of moral purpose that caused Mid-Staffs in the first place. The third worry follows on from this. Policy-makers have grasped that targets can damage the fabric of public services. What they have yet to grasp is quite how much of the energy and attention of the organisation gets shifted, by managers and frontline staff alike, into managing and massaging the figures. They have yet to understand what a disaster the targets culture has been for our services (see latest news about police statistics). Years ago, the author of The Audit Explosion, Michael Power at the LSE - writing at the very beginning of public sector targets - talked about the irony that any failure of accounting was tackled by more accounting. That is what seems to be happening here. Every failure of iron control is tackled by ratcheting up the pressure: more measures, bring in the police, legal duties - at this rate we will be jailing health staff. Maybe there will occasionally be justification for doing so, but what about their managers, what about the board, what about the policy-makers who designed the system that made these horrors possible? What would I do? Well, here are two things. First, I would humanise the wards by turbo-charging volunteering by patients, their families and their neighbours. Volunteers who work alongside staff are immune to the kind of pressures that are brought to bear on paid staff, and they act as a major humanising force. Second, I would sack the boards of hospitals which make these kind of scandals possible. It isn't a solution, but it is a bare minimum that those who took the decisions at the top should be held responsible. But in the end, the main thing that will shift the problem is inspirational leadership at local level, and at ward level. That is tough to achieve when staff at every level are motivated primarily by fear, and have had leadership leeched out of them by a generation of disastrous targets and detailed central control. For the past generation, Western Australia has been pioneering a different way of organising social care. It was the brainchild of their new mental health commissioner Eddie Bartnik, and it flew in the face of conventional methods, which assess needs and try to slot people into existing service packages. What he came up with instead was not just more flexible and more human, it was also less expensive. It was and is called Local Area Co-ordination. LAC is now working here too, notably in Middlesborough and Derby, and it is run by a group of local area co-ordinators who are the very opposite of specialists. They are more like coaches than social workers, and they start somewhere different. Rather than asking immediately about needs, they ask what their client wants to achieve in their life – then move on to the personal and social assets at their disposal. Then they try to see if what they need can be provided informally, from friends or family, or neighbours – it might be regular lifts or other kinds of regular visits. If the informal approach doesn’t work, then they fall back on conventional care packages. It is the reverse of the usual approach which starts with the care packages, and only if people complain very loudly do they fall back on informal solutions. The spirit of LAC is the cornerstone of the new Care Bill, thanks to the efforts of people like former social care minister Paul Burstow and Alex Fox of Shared Lives - but still the Care Bill doesn't exactly roll it out. Now Eddie Bartnik himself has been over and I was fascinated to see Alex Fox’s description of his visit. Of course, I subscribe to the vital importance of a flexible interface with the public, rather than what we currently have. I absolutely agree that LAC makes possible friendship, love and permanent social assets. I can see why it was so much more popular in Western Australia (though not in Scotland, but that's another story - about trying to shift unwilling professionals). "You won’t understand and meet people’s needs, if their needs are all you are interested in." That is absolutely right, and the way the system has undermined any of the assets that people have except their needs - their only passport to any kind of help - explains some of the way that it tends to maximise needs. Of course it does, if that's the only thing people have left. My own feeling is that LAC ought to be in place everywhere. But like so many of these other innovations, under the broad heading of 'co-production', you find you need a different kind of professional altogether to run them. I've just spent the weekend doing Ports-mouth, and not just because it is a Lib Dem city, but because of the museums, Mary Rose (fabulous), Victory, Warrior and so on. So just allow me three broad comments about the experience. 1. The Nelson Touch: we were told the familiar story about Nelson's penultimate words: "Kiss me, Hardy!" The Victorians, as I've always understood, felt uncomfortable about it and put it about that he had actually said 'kismet' (fate). I have always wondered about this. Imagine that Nelson did say "Kismet" after all, and then was surprised when his captain kissed him. Perhaps, since his last words were not "Hey! What are you doing? Gerroff!" we know that Nelson did in fact say "Kiss me, Hardy", after all. I certainly hope so - it would be in keeping with his character. What is really happening here was the moment in history that marked the end of the prevailing English character - sentimental, over-indulgent when it came to heroism, and many other things. It may also have marked the beginning (almost) of the prevailing British character (thanks mainly to Wellington) - stiff-upper-lipped, unemotional when it came to heroism, and many other things. I have seen signs that this is about to reverse itself. 2. The importance of 55 years. I am 55, it so happens. The gap between the Battle of Trafalgar and the launch of the ironclad Warrior, was exactly that, and what a shift it was (admittedly, Victory was almost a century old by then). You only have to walk the clean, uncluttered decks of Warrior to see the difference. Go forward another 55 years and you get to the Battle of Dogger Bank and the clash between battlecruisers that looked nothing like either Warrior or Victory. These are major shifts, and it kind of strengthens my thesis, after flying in Jumbo Jets and driving in Minis for half a century, that technological change is slowing down. 3. One war or two. I had to visit the Submarine Museum, because I have just published an ebook about submarines in the Dardanelles (E14 in particular, now that its wreck has just been found). To my surprise, they have bundled the First and Second World Wars together, all mixed together in the same glass cases. Perhaps, now that it is a century since the outbreak of the Great War, this is increasingly how the two will be regarded. But when it came to submarines (and much else, actually), the two wars could hardly have been more different - as I explain in my book Unheard, Unseen. Finally, I was moved and inspired by the film of Alexander McKee at the Mary Rose Museum, describing how he battled to find and then preserve Henry VIII's ship, throughout the 1960s. Having found the wreck, he tried to get an official search going, and was turned down - leaving him no other option but to rent the wreck site from the HM Commissioner of Wrecks to stop it being despoiled. McKee was a historian, playwright and diver (I have some of his books), but I never knew this story. It is actually such a familiar story too - about heroic individual or communal effort to preserve things in the UK, frustrated by boneheaded officials, and finally vindicated by history. Being a helpful kind of guy, I have written a number of blog posts elsewhere about what frustrates good decisions by governments - and how easy it is to get sucked into making bad ones. Sometimes appalling ones that echo down the decades. You can read my top ten here. But what about the good decisions? There has been huge debate about the peculiar tiff between Russell Brand and Jeremy Paxman on Newsnight about corporate control of government decisions, and what might be done about it. Leaving that topic aside, the source of so-called apathy – often rather principled, in fact – is often that sense of the sheer powerlessness of government: perhaps because of the sheer complexity of the system they are dealing with, perhaps because they don’t want the basic structures of power, on which they now rely for so much, to unravel. What can be done? The New Weather Institute is dedicated to optimism, and that change – the right kind of change – is not just possible but inevitable. So to speed the process along, here is my list of the top ten decisions UK governments could take to tackle the sheer intractability in which they so often find themselves. 10. End privileges for out of town and online shopping: We must keep our town centres alive, and it makes no sense to give such tax and parking advantages to the out of town retailers and the big online ones which operate out of Luxembourg, like Amazon. If we want thriving UK retailers, we need to be on their side. 9. Measure well-being and resilience as our main economic objective: Money just confuses matters, and especially now that Ofsted no longer require schools to promote resilience. We need to know whether the economy is doing a useful job or not. 8. Tax bonuses at 90 per cent: All bonuses are pernicious as measures for effective working, and can be disastrous. When bankers get them, they also cause inflation. 7. A speculation tax: the $1.4 trillion that pours through the world’s computers every day, dwarfing the available resources of central banks, is a clear and present danger, and we could do with the revenue. Nearly all of this avalanche of money is speculative. 6. End payment by throughput in public services: Too many service contractors are paid by the number of people they process, so there is no reason why they should make services more effective – especially when they are paid to process them over and over again. This is essential if we are ever going to make services affordable. 5. Institute a right-first-time system in public services: This is the implication of No. 6. It means minimising interventions, rather than maximising them, and putting people directly in touch with human beings with the power and experience to help them, once and for all. It means Human By Default. 4. Build a secondary housing market: No more renting – what we need is home ownership for everyone, which means building social housing and giving 99-year leases away for £30,000, on condition that it can’t change hands for any more than that during the lease (plus what has been spent on it since). This will finally bring down the value of all homes. 3. Major anti-trust action: We need to revitalise enterprise by enforcing the guidelines that no company should build up more than ten per cent of the UK market. Monopoly is antithetical to enterprise. This also means splitting up the big banks and turning them into more useful local and regional networks, capable of providing enterprise with the credit it needs. 2. Create more public money: This means shifting the way money is created from credit – usually in mortgage credit (which will slow down as we ratchet down house prices) – to interest-free direct creation by governments, spent into circulation by creating the green infrastructure we need. 1. Provide a citizens income: To every man, woman and child in the country, as of right, to give them the basics of life, ending the bureaucracy around income support and setting people free to earn, create or work as they see fit. Do any one of these and the current crises could be transformed; do them all, and the situation may be unrecognisable. All of these measures are designed to give people more independence, and other objectives would yield a different list. This list doesn’t, for example, include a land tax. It doesn’t do a whole range of things that progressives are supposed to want. That does not make them correct – they may have serious side-effects which would make them counter-productive. But here is the problem. To discuss solutions with this kind of scope, it means that you would have to do so outside the mainstream political structures, all of which seem to be dedicated to the tiniest imaginable changes. I’m inclined to think that conventional politics may not recover until it encompasses big debates as well as the smallest ones. Until you can bring big ambitions (I don't mean personal ones) into the party with you, then really – people will say – what’s the point? I had a fascinating day yesterday with the energetic management team at Nottinghamshire Healthcare NHS Trust, and it was an impressive experience. It is a big, integrated trust and integration is the big challenge for the NHS right now. I was there to talk about barriers to choice, the title of my independent review for the Cabinet Office which was published in January, but I found myself talking again about the peculiarities of the word. I became intensely aware of these while I was doing the review. One room full of hospital doctors (I won't say where), sat there with their arms crossed, tight-lipped and clearly enraged with me as some kind of ideological emissary from Whitehall. Here is the problem. There are many different kinds of choice - from the approved choice of provider, which is the traditional mode, right through to the choice to contribute yourself in some way (co-production). There are three models of choice, each very different, promoted just within the Department of Health and the Department for Education. But there is a political problem too, and I was reminded of that while I was talking. There is a Labour way of 'choice', which is the one introduced by public service economists from 10 Downing Street during the Blair years, which tends to mean a formal choice of provider, promoting competition within the public sector. There is a Conservative way of choice too, which I think is primarily about competition. That is how Conservatives understand the word, even though it could mean that the people who choose are actually just service commissioners. There is also a Lib Dem way of choice, perhaps rather less articulated, which is closer to consumerism. To have Lib Dem choice, people need to have options. Now, the difficulty comes because these different interpretations are not obvious, even in Whitehall. The term is used to cover all three interpretations. Often it is simply assumed to cover all three. Outside Whitehall, in some way, the opposite can also be true. People assume that when they hear the word 'choice', that what was meant was precisely the opposite of what they would like it to mean. It may be time we dumped the word altogether, because its baggage is weighing it down. So we need to ask ourselves: what goes beyond choice? The answer, it seems to me, is flexibility. And here is the ultimate irony. Formal choice as constituted might sometimes mean flexibility, but sometimes it means an extra layer of formality in the system, rendering it even less flexible than it was before. It isn't every day someone launches a new think-tank, but that's what I'm going to do today (not by myself, but with others). The New Weather Institute's blog already has a version of my excuse for doing so, but I thought I should put a version of it here. Because, why would anyone start another think-tank? It is a reasonable question. The centres of the world’s greatest cities are now heaving with think-tanks, full of young men in pressed blue shirts and young women juggling with PowerPoint presentations. The problem is that there is something circular about most of them (but not all). Either they are think-tanks with an agenda of their own, complaining about the present, when their answer to most questions is – well, I wouldn’t start from here if I were you. Or they are think-tanks plugged umbilically into the establishment, dedicated to suggesting very small solutions to very narrow problems, with as little reference as possible to context or future. People with life experience starting organisations and making things happen, who can tell the difference between a real trend and a dud. Enough understanding of the complexity and paradoxes of the present to begin to navigate the future. Faith in people, communities and creativity, rather than disconnected, dehumanised data. We humbly submit the New Weather Institute as a different way forward. We are not young (I fear). We are not complacent about the present, stuck in the past, nor dismissive of the future. We don’t extrapolate trends. We don’t suffer from the besetting sin of so many conventional think-tanks: that an idea is better if it attracts a few headlines than if it might actually work. We are a co-operative – as far as we know, the first co-operative think-tank. We have no expensive offices and don’t require huge overheads that our customers need to underwrite. We have between us extensive experience, not only of working on the projects which map out ways forward for organisations and people – but of making the future happen, by starting the institutions or shaping the ideas that in turn have an effect on those around us. We don’t know what’s going to happen, of course. Nobody does. But then neither do we pretend we can measure it, bottle it, or reduce it entirely to graphs. We’re old enough to know that things DO change. That they change sometimes all of a sudden, and that they need a nudge or two sometimes to change in the right direction. That's what I hope the New Weather Institute can give. I listened to the Remembrance Day ritual in Whitehall while I was painting my hallway this morning, and it reminded how different these occasions are these days from when I was growing up. In the 1970s, the overwhelming sentiment seemed to be that it should "never happen again". Now hardly anyone seems to say that. I suppose this is because it is in some ways happening. Our forces are in almost constant action abroad. The sentiment now seems to be unselfishness, rather as it was in the 1920s. A strange shift. I am at the back of the church looking at the straight backs of all the military men in the congregation, in this whitewashed Saxon church. They have filed past me into the pews already, with their poppies or medals or occasionally both, their women in subdued dark blue coats. Even those not in uniform, and obviously from the local army base, are in subdued dark blue suits. But the celebrant’s little speech at the beginning obscures something rather important. It all feels so ordinary that you hardly notice it, but the vicar is missing (this is a group parish). The choir is no more. There is no procession with a cross at the beginning of the service. The same man must do almost everything except juggle. Outside, the November sunshine dries the damp in clouds of steam from the thatched roofs. Inside, we hear one of the major generals reading a list of names from the village killed in the First World War. It is a small village, but a long list, and it is relatively easy to guess which class the names hailed from. ‘Is everyone sad?’ my little boy next to me asks. Then the hymn starts up. It is ‘O God our help in ages past’. 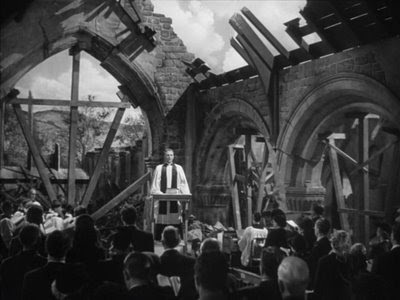 For a moment, I suddenly get a flash of the closing scenes of the 1942 film Mrs Miniver (see picture above). One of the themes of this Greer Garson film was the corrosion of snobbery in the face of war, but it is the last scene I am thinking of. The congregation are in church, battered and bruised, and they sing a rousing English hymn (actually ‘Onward Christian Soldiers’). Then the camera pans out and you see the church has been bombed and has no roof. This church still has its roof, the product, no doubt, of decades of raffles and village fetes. The church is cared for and comfortable. It isn’t like the bare and abandoned medieval churches you find in France. But there is something of the same sense of embattled yet unacknowledged decay that ended Mrs Miniver. It occurs to me that these middle classes, with their commitment and their service, are going to have to learn something from the words of the final hymn. There is a time to cease from mental fight. Maybe even a time to let the sword sleep in the hand. But this isn’t one of them. I can't remember which by-election this was, but it was more than a decade ago, but I had a sort of revelation about the Russell Brand position in politics - which is basically, don't vote; it only encourages them. I had gone canvassing into a new estate, relatively prosperous, leafy and off a main road. There were 12 houses in a cul-de-sac. Every front door opened when I knocked, and everyone said exactly the same: the weren't voting, 'on principle'. This was not apathy. Of course it would have been easy for me to snobbishly dismiss the beer-bellies I had seen and call it apathy, but it wouldn't have been true. It was a moral position they were taking, of deep disapproval. Even so, I am surprised to hear Jeremy Paxman coming to Brand's defence. If anyone knows about the compromises inherent in the art of politics, he does. The issue isn't about lying, as Paxman claims. What politicians do is frame the truth (didn't I promise not to use that word a few blogs back?) - but doing so for a purpose. So I don't agree with Paxman or Brand that the problem is 'lying'. Politicians can never be completely open, and nor would we expect them to be, with the pressures they are under. Though the antics they perform before microphones are occasionally embarrassing and usually irritating. No, there are three different reasons why Paxman and Brand have a point. 1. The corrosion of political language. Most of the political language of choice now was hatched in the 1940s - 'education for all', and so on, even 'social security'. People don't believe it any more. It goes in one ear and out the other. It is a symptom of a deeper dishonesty and a failure to think afresh. It is enraging because it is so deadening. 2. The hollowing out of political parties. 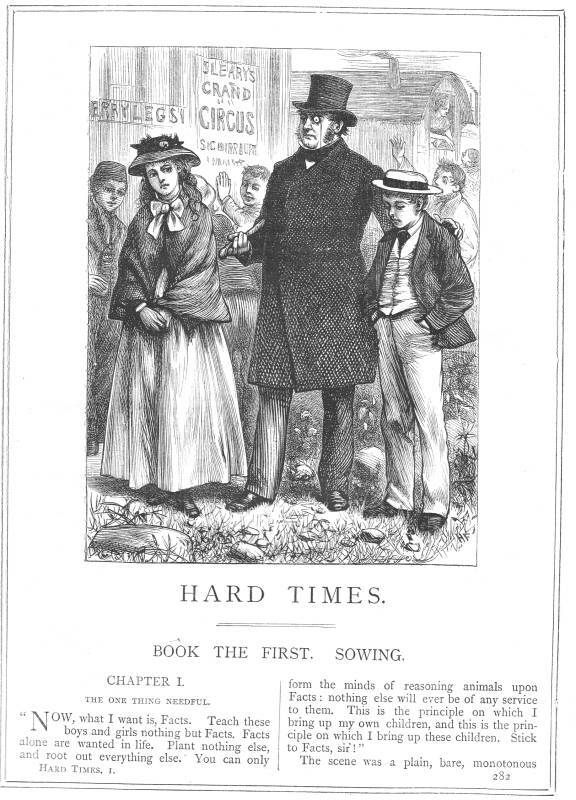 The combined membership of all our political parties is smaller than the circulation of a small women's magazine because there is nothing to do, no content, no training beyond electioneering, no careers beyond elections, no thinking, no nothing, except some deference and piles of unwanted leaflets couched often in the most objectionable language. Why would people join? What commitment would there be to them as individuals if they did? 3. There seems no purpose behind it all. This is why the untruths are so alienating. 'Framing the truth' might be forgivable if it was to some purpose, but modern politics seems so often to be defending indefensible and useless institutions or worn-out ideas, rather than imagining how things might be run more effectively. It is as if the political class has been drafted in to defend the status quo by creating a complicated charade that gives the impression they are seeking change. Change those things, break open the consensus, break open the tired old parties and then maybe we might get people to put aside their principles and vote again. As the Home Office flings out more and more peculiar gimmicks - poster vans, bonds for foreign visitors, doctors as immigration officers - I have been musing over the weekend what the ten worst decisions by the UK government have been since the Second World War. Let me say straight away that these are decisions with a serious long-term impact, which means that it may go too easy on the coalition - the fact is that, since they have only been in office three years, it is hard to see which decisions will really resonate down the years (personally, I think the idea of investing in nuclear energy, when the rest of the world is shunning it, might well be on a later list). You can't tell which decisions really have long-term implications without mulling it over for a few years at least. The other thing to say is that some these decisions are worthy and vital, like the NHS and ending the 11+ exam, but which were taken in a flawed way, allowing the arguments to echo on disastrously through the decades. 10. The Pensions Act (1986): It ushered in a faulty design for personal pensions which would encourage people to think their retirement was covered, but actually flung them into the hands of the financial services industry which has systematically fleeced them. The result: the average pension pot in the UK is now £25,000 (will pay out £1,250 a year). 9. Tony Crosland's flawed blueprint for comprehensive schools (1965): Following the American model, and ignoring the evidence which showed otherwise, UK comprehensive schools were designed far too large, as mini-factories, far too impersonal - they consequently alienated sections of the middle classes who would otherwise have welcomed them, and the education wars continue now as a result. 8. Setting up the NHS on an over-professionalised basis (1948): The most disastrous legacy of the Attlee government. It meant that the voluntary infrastructure for health disappeared and, in the case of poor communities, was systematically destroyed - guaranteeing that the NHS, the most important decision of all in some ways, would eventually become unaffordable. 7. Harold Macmillan's deregulation of building standards (1951): In search of the magic number of housing starts (300,000 a year), Macmillan ushered in the age of the jerry-built high rise flats, at vast expense, still not paid for and still blighting the poorest communities. 6. Gordon Brown's great roll-out of targets in public services (1998): The target approach wasn't new, but it was a disastrous adoption of the line most identified by consultants McKinsey. As a result, services were hollowed out, became much more expensive, productivity went down and their very future is now in doubt. 5. The Iraq War (2003): A flawed project, paid for largely by the Chinese, which resulted in a million dead in Iraq alone and seemed to reveal the western powers as powerless and duplicitous. 4. Geoffrey Howe's abolition of the Corset (1980): This was a direct result of the abolition of exchange controls the previous year, the Corset kept house prices low by limiting the amount of money flooding into the housing market. Its demise led to the 30-year housing bubble and the slow impoverishment of the middle classes (see my book Broke). 3. The failure to shape the European Community (1955). The UK withdrew from the crucial Messina Conference which led to the founding of what is now the European Union, failing to shape its institutions and consequently finding itself forever dissatisfied with them. 2. Big Bang (1986): Financial services in the City had to face modernisation, but the decision to divide jobbers from brokers fatally ushered in the conflicts of interest that would turn financial services into such an overwhelmingly corrosive force. 1. The decision not to create an Oil Fund to invest the revenues from North Sea Oil (1976): The Callaghan government decided not to create a sovereign wealth fund like Norway's to invest oil revenues running at £18bn a year. Nor did subsequent governments use the revenues to invest in new, renewable energy sources. Consequently, we are now buying Norway's gas and we squandered the money. We allowed the rising petro-pound to throttle the UK's unmodernised industrial base, without using that wealth to modernise. A national tragedy. Decisions based on ideology, disconnected from the real world (8, 4, 2). Decisions based on faddish solutions (10, 9, 6). Decisions taken in abject surrender to more powerful forces (5). Decisions taken with breathtaking UK-style short-termism, and a bone-headed failure to look ahead (7, 3, 1). Now, am I right? I don't expect everyone agrees with me - but, well, why not? And, most important, what can be done about it? How do we see the joined-up possible futures more clearly. This is one of the areas where my new venture, the New Weather Institute, the UK's first mutual think-tank, is dedicated to seeking out solutions. More than a decade ago, I was asked by a member of Tony Blair’s cabinet (to pass the time of day) what I was writing about. I had just published a book about new kinds of money, and I told him I was writing about our habit of measuring too much. The news from Colchester General Hospital, where managers are said to have bullied staff into falsifying target data, confirms that it is now time we worked out an urgent answer to this question. The problem about using numbers to control is that they only give the appearance of hard objective data. In fact, the numbers are chained inexorably to definitions, which involve words which can be endlessly manipulated. The truth is that the target culture, which the coalition has failed to completely confront, creates a kind of cage where – the more safeguards you put in – the more difficult it is to operate at all without manipulating those definitions. When a hospital has to bully staff to manipulate figures, then you clearly have evidence of a failing hospital, and there have been complaints about Colchester for some time now. But the real point is that Colchester is just the tip of an iceberg. We are still living with the cage of numbers woven by Gordon Brown. 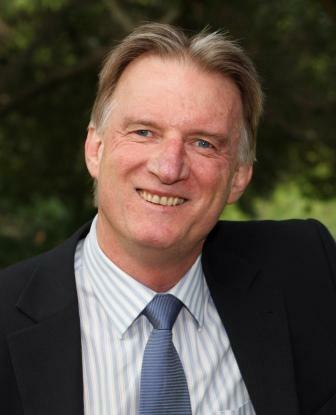 This is the advice of system thinker John Seddon, that manipulation is absolutely endemic, and it isn’t the fault of the frontline staff who do the manipulation – it is the fault of the system that requires it. Worse, the advent of turbo-charged targets with money attached (payment by results contracts) turns that manipulation from a simple but regrettable management habit into outright fraud. The problem is that this manipulation gets so habitual, in every sector, that it takes up most of the creative energy of the staff and managers (I don’t exaggerate), and it spills over into outright falsification – which seems to be what has happened in Colchester. This kind of control by measurement carries within it a kind of fantasy about objectivity. It is the fantasy also that you can somehow measure outcomes, real objectives – not the pretend outcomes that service managers gargle with – and that all you need to do is check up on the process, and the great humming machine that will get you there. The coalition rejected the symptoms of this Blairite fantasy, but allowed themselves to continue the great humming machine fantasy. Hence the current difficulties. And this is just the beginning. This time, next time, or the time after, the scandal will result in a widespread investigation into the manipulation of targets, especially in privatised services, which will find that it is absolutely ubiquitous. The emperor will clearly have no clothes then, so work is going to have to start now on the system that replaces it. "The toxic cocktail of targets, savings, inspection, reputation-saving, top-down bullying, confused responsibilities and hubris is making the NHS unmanageable and dangerous. Inspection does not make us safer. People do, People don’t come to work as liars, target fiddlers and cheats; it's what organisations reduce them to." Quite so. It really is time the coalition got to grips with this toxic legacy of the old regime. I have gained a bizarre insight into the strange regulatory world about what you can say as a charity or a community interest company (CIC), mainly because I have been helping to launch a new mutual think-tahnk, the New Weather Institute. "The promotion of (or opposition to) changes in the policy of a governmental or public authority in relation to any matter is not allowed." "Any political activities in which CICs do engage should be closely related to the non-political community benefit activities which they are set up to carry out." 1. The regulations about semi-political activity and what CICs and charities can say in public are already tangled and confused, have been so for years, and - hey! - I'm not even intervening in an election campaign. 2. The storm which 38 Degrees has drummed up about the Lobbying and Transparency Bill now going before the House of Lords today is ridiculously off the mark. I say this partly because I find 38 Degrees increasingly irritating, and partly because the Bill is not - despite what they are saying - changing the contradictions about third-party political campaigning, or about political campaigning by charities, which have been for the last 13 years confusing and confused. All they are doing is lowering the spending limits for people, organisations or oligarchs who want to intervene in elections. Now, it seems to me that two reforms are urgently needed here. First, we need to close the loopholes that allow billionaires and oligarchs like the shadowy Koch Brothers in the USA to spend money intervening for or against candidates in elections. It has hardly happened yet, but it will - probably over something like Europe, immigration or abortion, probably in a handful of marginal constituencies. The other reform we badly need is the converse of that, to prevent billionaires getting around this legislation by giving vast sums to political parties or setting up their own. The Lobbying Bill tries to do the first but not the second. It should do the second, but the fact that it fails to do so does not take away from the fact that we need to close the Koch loophole urgently. I don't understand why 38 Degrees has drummed up such a storm against such an urgent reform. Because once Koch UK has landed here, it will be far too late. I know the campaigners say that the new law will confuse matters for campaigners. It won't: the law is already ridiculously confused and needs sorting out, but the Lobbying Bill won't make it any more so, and it is disingenuous of 38 Degrees to pretend that it will. The real question we need to ask them is: why don't you want to legislate to stop oligarchs intervening in our elections? I don't get it but I do hope the Lords have the guts to ignore 38 Degrees and pass the Bill this afternoon. Why should taxpayers subsidise wages? I gather it is the anniversary today of Soviet troops marching into Hungary in 1956. A good day, in fact, to think about the consequences of ideologues - especially as I heard the most irritating ideologue on the Today programme this morning, talking about the living wage (starts at 1hr 40 mins). The Living Wage, as most people know, is the amount calculated that people need to earn to survive economically without recourse to benefits. It is, inevitably, rather higher than the minimum wage. So enter the ideologue, in this case Steve Davies from the 'free market' think-tank the Institute of Economic Affairs. I put 'free market' in inverted commas on the grounds that I also regard myself as being in favour of free and open markets, as one of the guarantees of liberty (yes, I remain an old-fashioned Liberal). But I am not a true believer - I'm not a heretic, defined in religious terms as someone who pushes one doctrine to the point of absurdity. Unfortunately, the Today programme is still subject to the Law of Confident Economists. Which means that you can apparently silence interviewers and conversations on almost any subject by mouthing economic doctrines in a confident tone of voice. Davies explained that Ed Miliband's wheeze to encourage companies to pay a Living Wage through the tax system was a bad idea, on the grounds that only increased productivity can genuinely raise wages. Otherwise it will lead to job losses as businesses become unprofitable. All of which is true, and that would indeed be the end of the argument - until you look at the other side of the coin. Who exactly does the IEA imagine will subsidise the salaries of these people who are in full-time work but not paid enough to get by? Presumably the taxpayer - but why should the government subsidise business in this way? And isn't it ironic that a supposedly free market think-tank should praise a situation where businesses have their payrolls subsidised by the state? No, the situation where companies pay salaries which are impossible to live on is not sustainable for so many reasons. What the IEA needs to do is to raise its eyes from the articles of holy writ and see the world as it really is - and get to grips with the way that life is becoming unaffordable for so many of us, even when we are in work. Blame monopoly. Blame inequality. Blame the banks, but something else is going on which breaks all the rules of the kind of free market that the IEA espouses. And if you want an example of it, take a look at the World Development Movement's data about the five mega-banks which have made $2.2 billion from speculating in food over the past two years, making it increasingly expensive for the poorest people in the world. That's what happens when you hand economics over to ideologues, true believers and fundamentalists. 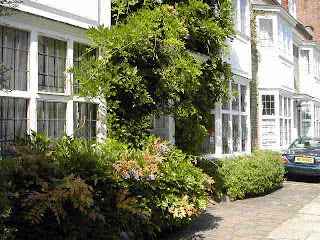 Just before the First World War, my great grand-parents bought a house in Mulberry Walk in Chelsea. They were modest town houses but it was an attractive street, with its gas lamps and brick pavements - and it had to be to attract the right clientele given that Chelsea remained a raffish suburb full of artists and slums. My great-grandfather was killed at the Battle of the Aisne, six weeks into the war, and my great-grandmother lived there for the rest of her life before dividing the house into flats for her daughters. I don't remember her, but I know she was at my christening, almost certainly with her usual copy of Liberal News. My own grandparents lived in the downstairs flat, and I remember it very well. When they sold it in 1975, during one of those slumps in the property market that used to happen in the 1970s, it still had one of the original gas-lamps concreted into the back garden. It gave the whole house a kind of Narnian air of magic for me. By then, it was clearly going up in the world. Sir Keith Joseph had lived there when he was health minister, but it was within a brisk walk of the World's End, and that was then a different world. I don't come from a wealthy family by any means, or so I kept having to say when I wrote my book Broke: Who Killed the Middle Classes earlier this year. But I did keep meeting people, while I was writing the book, who could no longer live anywhere near the neighbourhoods where they grew up. We have become used, during the debates about gentrification, to believing that this was just a working class experience. It isn't. I live in a small house in Crystal Palace. My children will not be able to afford to live here, any more than I can afford to live in Maida Vale where I grew up. But even so, I got a bit of a shock when my cousin forwarded a copy of a property article (not online) which used Zoopla to describe Mulberry Walk as the 16th most expensive street in London. The houses are all the same as those where my great-grandparents had walked down in 1914, but one of the double-fronted homes like they bought has just gone on the market for £15.75 million. I don't know what they bought it for, and I expect my great-grandfather used the legacy from his father - he was on a Lieutenant-Colonel's salary. It wasn't huge. But even so. The point I'm making here is that the experience of being priced out of your own neighbourhood is now so common in south east England, and other parts of the country, as to be almost ubiquitous. It is a by-product of the ongoing 30-year housing bubble that we have endured and which is corroding the idea of a property-owning democracy - leaving us at the whims of landlords, and equally bubblesome rents, for all our lives. 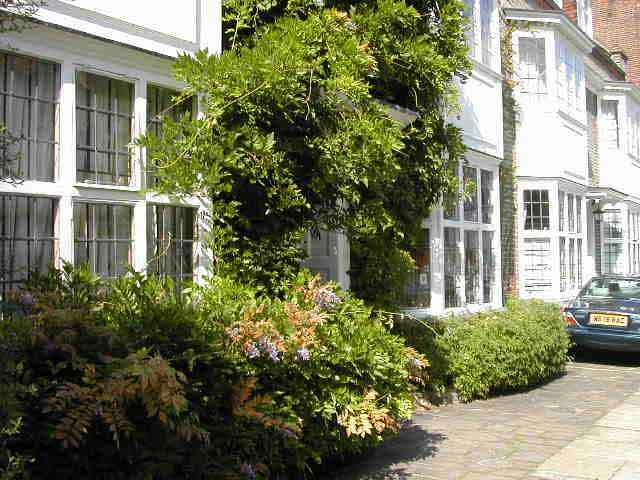 In a generation's time, my own children will be staggered that I used to stay in Mulberry Walk most weeks. It is a sad memorial for the middle class dream. I'm pretty staggered now. Do you remember the Australian Democrats? They were the real 'Liberals' in Australian politics and dared to use the slogan 'Keep the bastards honest' in their elections since 1980. Despite the daring of the slogan, and the horrified admiration from some Lib Dem campaigners I know over here, the slogan wasn't really a success. The party lost all its national representation in 2007 and are now down to 0.3 per cent of the vote. We might perhaps diagnose their difficulty as a party which did not really know what it was. Such is the danger of the Lib Dem besetting sin - to paper over ideological cracks with narratives that are all about process and positioning. It works for a bit but then, like the Democrats, there seems no real purpose and the whole thing just implodes. So I was fascinated to see there is a new radical Liberal-style party in Australian politics, and they call themselves the Mutual Party. What I find so interesting about this is that it may be a glimpse of what a new Liberal Party would look like anywhere, if it started now, without some of its peculiar baggage - because it is both recognisably Liberal and also obviously modern. Support for self-employment, small businesses and independent owners - a wide distribution of ownership of economic assets and property and the breakup of concentrations of economic and market power. Support for civil society - a strengthening of community groups, voluntary associations, support networks, social enterprises, cooperatives and mutuals. Individualised funding for consumers and families - self-directed services and individual budgets in disability, mental health, ageing, education, and social services. Governance reform in democracy, parliament and public institutions -innovation in public voice and citizen empowerment and the end of career politicians. It is recognisably a close relative of the Liberal Democrats in the UK. But the UK Lib Dems have a peculiar blindness about economics, or perhaps a baggage drawn from a century or so of buffetting by the great argument between right and left - state or private ownership - now a monumental irrelevance. "The big ideological dispute in the 20th century was between liberalism (based on individuals) and socialism (based on the state). That dispute is now over." Years ago, I pointed out to the Lib Dem leader at the time that it was significant that, even though we had only a handful of seats, most of them were in the top ten local authority areas for self-employment. He didn't agree with me and I thought then - and think now - that we are missing an opportunity to align ourselves alongside the real entrepreneurs. It looks like the new Mutual Party has done so.